With £3 billion worth of possessions kept in cars overnight – what’s inside your vehicle? New research by Your Cover insurance has revealed that drivers leave more than £3 billion of belongings in their cars overnight. It also found that many car owners often leave their vehicles unlocked when the car is not occupied. In fact, a very surprising 53% of motorists in the survey admitted they did not always lock their cars at night. Many drivers treat their cars rather like a second home, using their vehicle to house many of their everyday, personal items. Items such as Sat Navs, handbags and mobile phones topped the list for the most common items left in cars overnight. Other items included portable music devices, golf clubs, cameras and sunglasses. Women seem to be the worst culprits – many admitting that their car is often used as a ‘dumping ground’. Popular items left in women’s cars are make-up and spare ‘driving shoes’. Research carried out by Debenhams department store in February this year, revealed that each British woman carries, on average, around £256 worth of make-up. According to the research, the average cosmetic bag is made up of 13 products each costing around £20 each. Most women will also carry their favourite perfume with them at all times. So, how much does this really add up to for the average car owner? Obviously, it can vary dramatically depending on the value of certain items. Here’s a hypothetical example to give a rough indication of how much a car stash could be. So Mrs X’s grand total for these everyday items is over £1250! 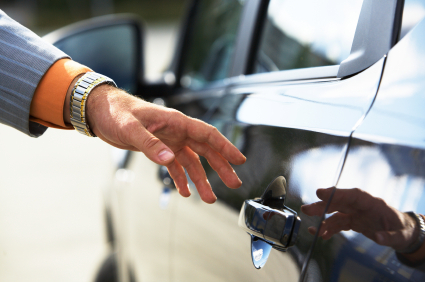 Most standard car insurance policies will not include cover for any items stolen from your vehicle. However, some policies might include handbag cover for women or offer it as an optional extra. This could help foot the bill if your bag was stolen from your vehicle. Some items that you carry in your car may actually be covered by other insurance that you have, such as for your home. Certain items, including I-pods and cameras, can normally be specified on your policy with the option of covering them while they’re away from the insured address. Check your policy wording carefully or speak to your provider directly if you’re unsure what items are covered under your policy.